Introduction and Objectives: Chronic obstructive pulmonary disease (COPD) is characterised by airflow limitation with a post-bronchodilator FEV1 : FVC less than 0.7.1 Reversibility (post-bronchodilator increase in FEV1 of 12% and 200 ml)1 is still used to exclude a diagnosis of COPD;2 however, recent baseline data from the UPLIFT trial have shown that the majority of patients with COPD fulfil these criteria.3 An increase of 400 ml is considered clinically significant,1 is highly suggestive of asthma and should be treated as such.4 The current study explores the relationship between spirometric bronchodilator response and other lung function tests and computed tomography (CT) scans in patients with a diagnosis of COPD including a 4-year follow-up. Methods: The study population consists of well-characterised patients with post-bronchodilator FEV1 : FVC less than 0.7 and clinical features of COPD. Full lung function tests and CT analysis (presence of visible emphysema and densitometry) were performed at baseline and at 4 years. The results of these were compared for three groups based on FEV1 increase post-bronchodilator: A <200 ml or <12%; B >12% and >200 ml but <400 ml; C >400 ml. Results: There was no significant difference in smoking status, gender or age between the three groups. However, group C had a significantly greater baseline FEV1 (% predicted) and absolute decline in FEV1 but a lesser decline in lower zone voxel index and KCO (% predicted). In addition, group C had a greater decline in FEV1 (% predicted), although this just fell short of the criteria for significance relative to group B (p = 0.058). The results are summarised in the table. Conclusions: The majority of patients in this study exhibited a bronchodilator response supporting the findings of the UPLIFT trial.3 The data suggest that significant bronchodilator reversibility does not reflect other differences in COPD phenotype; however, it does indicate a subgroup with a more rapid increase in airflow limitation (FEV1) but less rapid deterioration of lung parenchyma (KCO and densitometry). Global Initiative for Chronic Obstructive Lung Disease (GOLD). 2007. http://www.goldcopd.org/ (accessed Oct 2008). Background: Dual energy x ray absorptiometry (DEXA) is an established method to measure thigh muscle mass in chronic obstructive pulmonary disease (COPD). However, it is expensive, not readily accessible and involves exposure to ionising radiation. An alternative technique using ultrasonography can be used as a non-ionising, bedside method to measure quadriceps size, although its use in COPD has been limited. We used ultrasound to measure two indices of quadriceps size—muscle thickness (Qt), and cross-sectional area of the rectus femoris (Qcsa), in a group of COPD subjects. The relationships between these indices to total (Tlean) and thigh lean mass (Qlean) measured by DEXA and to quadriceps strength were also determined. Methods: 18 COPD patients (mean (SD) age 67.06 years (8.24), body mass index (BMI) 28.21 (5.86), FEV1 48.83% (19.25) predicted, 11 men) underwent scans of the dominant thigh using a portable ultrasound machine (Hitachi EUB-425). With subjects in the supine position, the scanning site was identified as the mid-point between the tip of the greater trochanter and the lateral knee joint line. From frozen, real-time cross-sectional images, the outline of the rectus femoris was traced to calculate Qcsa, and Qt was measured as the distance from the superficial fat–muscle interface to the underlying femur. Scans were repeated by the same operator after a minimum of 2 days. Tlean and Qlean were determined by DEXA, and isometric quadriceps strength was measured on an isokinetic dynamometer (Cybex II Norm) during a maximal static contraction with the knee at 70°. Results: Mean (SD) values were as follows: Qcsa 4.72 cm2 (1.02), Qt 22.86 mm (7.10), quadriceps isometric strength 128.72 Newton-metres (56.69), Tlean 48.38 Kg (11.69), Qlean 4.20 Kg (1.24). Qcsa and Qt were significantly correlated to both Tlean and Qlean, whereas quadriceps strength was only correlated to Qcsa (table). Intraclass correlation coefficients for the repeat measures of Qcsa and Qt were highly significant, indicating good reproducibility for this method (r = 0.94; p<0.001 for Qcsa and r = 0.98; p<0.001 for Qt). Conclusions: Our data suggest that a simple bedside method using portable ultrasound can be employed to measure quadriceps size in COPD. The technique has good reproducibility and correlates well with DEXA. S88 TIMED UP AND GO: AN ASSESSMENT TOOL FOR MOBILITY IN PATIENTS WITH CHRONIC OBSTRUCTIVE PULMONARY DISEASE? Background: The Timed up and Go (TUG) test assesses functional mobility based on the time to stand from armchair, walk 3 m, turn around, walk back and sit down.1 The potential for its use in chronic obstructive pulmonary disease (COPD) is unclear. We determined the relationship of TUG with the incremental shuttle walking test (ISWT) and other accepted measures in COPD. Methods: We studied 30 clinically stable male patients with COPD and 15 age-matched controls. Spirometry, oximetry, TUG, ISWT, DXA scan for bone mineral density (BMD) and body composition (Hologic, Discovery) together with circulating albumin and IL-6 were determined. Patients completed quality of life scores (SGRQ). Results: Demographics of patients and controls are shown in the table. In patients, TUG was inversely related to ISWT (r = −0.68, p<0.001) and the following clinical parameters: FEV1 % predicted (r = −0.496), oxygen saturation (r = −0.590) and directly to SGRQ total (r = 0.524) (p<0.05). ISWT was also related to these variables (all p<0.05). However, TUG was also inversely related to fat-free mass index (FFMI; r = −0.400), BMD of hip (r = −0.542) and albumin (r = −0.509) and directly related to log IL-6 (r = 0.413; p<0.05), whereas ISWT was unrelated to these variables (p>0.05). Conclusions: The TUG test and ISWT were strongly related in male patients with COPD. Both tests had similar relationships with indicators of the severity of lung disease and health status. However, the TUG test was related additionally to indicators of musculoskeletal comorbidities and systemic inflammation. The TUG test is simpler to perform than the ISWT and may have a role in detecting reduced mobility in COPD patients that could be applied in primary care. Podsiadlo. D J Am Geriatr Soc 1991. Background: The luminal epithelium of the respiratory tract is lined by a thin layer of liquid (epithelial lining fluid, ELF). In healthy humans ELF glucose concentrations are approximately 12.5 times lower than plasma (Baker et al, J Appl Physiol 2007;102:1969–75). ELF glucose concentrations are elevated 4–8-fold in patients with cystic fibrosis, but it is not known whether this is due to a disease-specific defect of glucose transport or the general effect of lung inflammation. This study aimed to determine the effects of lung inflammation due to asthma and chronic obstructive pulmonary disease (COPD) on ELF glucose concentrations before and after prednisolone treatment. Methods: 12 healthy volunteers (FEV1 109 + 12% predicted), 21 COPD (FEV1 54 + 16% predicted) and 21 moderate–severe asthma (FEV1 59 + 14% predicted) patients underwent bronchoscopy and bronchoalveolar lavage (BAL). Venous blood and BAL fluid were analysed for glucose, urea and albumin. 13 COPD and 12 asthma patients underwent repeat bronchoscopy after 2 weeks prednisolone 40 mg/1.72 m2 surface area. Results: BAL glucose concentrations were significantly greater in COPD (0.12 mmol; 0.07–0.16; median (interquartile range)) and asthma (0.11 mmol; 0.06–0.13) than in healthy volunteers (0.03; 0.01–0.05; p<0.001, Kruskal–Wallis). Neither BAL urea (p = 0.329) nor BAL albumin (p = 0.853) differed between groups. BAL : blood glucose ratios were COPD (0.018; 0.011–0.046), asthma (0.017; 0.010–0.025), healthy volunteers (0.006; 0.003–0.010; p = 0.001). Neither BAL : blood urea (p = 0.527) nor BAL : blood albumin (p = 0.524) ratios differed between groups. There was no change in spirometry, systemic (C-reactive protein) or lung (BAL cell count) inflammation, BAL glucose concentrations or BAL : blood glucose ratios after prednisolone treatment. Discussion: Low ELF concentrations are maintained by the epithelial barrier, which restricts glucose movement from blood to ELF, and by epithelial glucose transporters, which remove glucose from ELF (Kalsi et al. Pflugers Arch 2008;456:991–1003). Elevated BAL glucose concentrations in COPD and asthma are unlikely to be accounted for by impaired epithelial barrier function as BAL urea and albumin concentrations are not elevated. Airway inflammation in asthma and COPD may therefore impair epithelial glucose transport processes. In these patients prednisolone did not significantly reduce inflammation or improve lung function, which may have accounted for its lack of effect on ELF glucose concentrations. Introduction: Several outdoor air pollutants have been associated with respiratory morbidity and mortality, but specific effects can be difficult to ascertain without detailed clinical phenotyping and controlling for covariates. Patients with alpha-1-antitrypsin deficiency (AATD) exhibit faster decline of lung function than subjects with usual chronic obstructive pulmonary disease (COPD), thus represent a group in whom studies of factors influencing decline may be more sensitive. Methods: All subjects of the PiZZ genotype from the UK AATD registry with at least four annual assessments of lung function were studied. Decline of FEV1 and KCO for each of the resultant 220 patients was calculated using linear regression. Pollution exposure (particles, ozone, sulphur dioxide, nitrogen dioxide) from the period of decline was extracted from GIS maps, matching the measurement to the patients’ home address. Clinical predictors of decline were sought using univariate models, and those significant added to multivariate models that included pollutant data. Single pollutant models were used due to multicollinearity. Results: In the univariate models of FEV1 decline, male gender, higher exacerbation frequency and baseline KCO were associated with more rapid decline (p = 0.034, 0.025 and 0.001, respectively). In similar models for KCO decline only exacerbation frequency predicted rapid decline (p = 0.016) although male subjects tended to decline faster (p = 0.064). Past cigarette smoke exposure and current smoking status were non-significant in both models. In the multivariate models no pollutants independently predicted FEV1 decline, although baseline KCO remained predictive (p<0.001). Similar models for KCO decline did show an association between higher PM10 exposure and rapid decline (p<0.001), such that PM10 explained 9% of KCO variability (fig). Conclusions: Exposure to ambient particulate matter predicts KCO decline in AATD, unlike smoke exposure and other covariates. FEV1 decline is predicted by exacerbation frequency, similar to usual COPD, but also by baseline KCO, emphasising the importance of this measure in the assessment of disease. 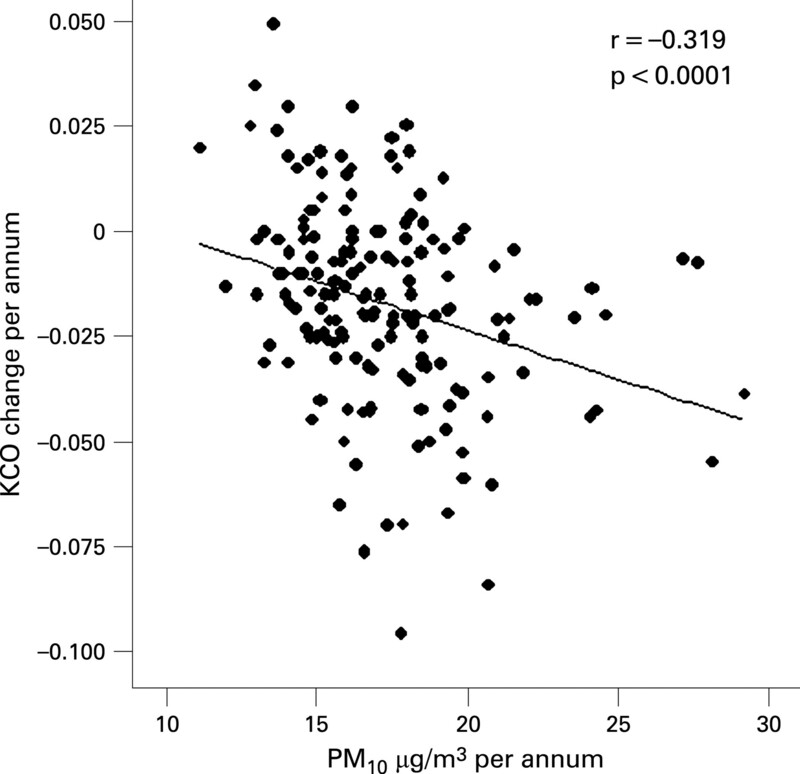 Abstract S90 Figure PM10 correlates with decline of KCO in AATD. Background: AZD9056 is a potent selective antagonist at the purinergic P2X7 receptor, which is involved in processing and release of the pro-inflammatory cytokines IL-1b and IL-18 (Ferrari et al. J Immunol 2006;176:3877–83). We have shown that sputum IL-1b concentrations are increased in chronic obstructive pulmonalry disease (COPD) and may play a key pro-inflammatory role (Newbold et al, Proc Am Thorac Soc 2005;2:A395). Methods: We conducted a double-blind, randomised, parallel-group, multicentre study comparing the effects of 4 weeks’ treatment with oral AZD9056 400 mg daily and placebo in patients with mild/moderate COPD (GOLD stages 2–3) who produced sputum on most days. Efficacy measures included lung function (FEV1, FVC, VC, IC, PEF), exercise tolerance (6-minute walk), symptoms (Bronkotest diary card, and BDI/TDI for dyspnoea), quality of life (SGRQ), inflammatory markers in the blood (differential leucocyte count, IL-6, IL-8, TNFα and CRP), and also in the sputum (differential leucocyte count, IL-1b, IL-8, IL-18) in a subgroup of patients. Plasma and sputum concentrations of AZD9056 were measured. Results: 134 patients were randomly assigned to treatment, of whom 120 completed the study (60 patients were included in the sputum subgroup of whom 57 completed). Statistical analysis was carried out on an intent-to-treat basis. AZD9056 was well tolerated, with similar numbers of adverse events (none serious) occurring in each treatment group; consistent with other studies, gastrointestinal side effects were more common in the AZD9056 group. AZD9056 was measurable in the sputum. However, no statistically or clinically significant effects of AZD9056 were seen on any of the clinical outcome measures, nor on cellular or soluble inflammatory markers in blood or sputum (including sputum IL-1b concentrations). Discussion: The lack of clinical benefit seen in this study was disappointing, particularly since a 4-week phase 2a study of AZD9056 in patients with rheumatoid arthritis (RA), another disorder associated with elevated IL-1b concentrations, showed significant positive clinical effects (McInnes et al. Arthritis Rheum 2007;56:s793). It may be that in COPD, in contrast to RA, other pathways of IL-1b production are more important than P2X7 receptor activation. Acknowledgements: Presented on behalf of the PACE study investigators.